Educational Flash web sites aside, the iPad is a great device for browsing the internet. At the heart of this is Apple’s flagship browser, Safari. Overall, Safari is a capable browser on the iPad but there is some functionality missing from the app when compared to its big brother on Macs. Fortunately, iOS has enough tricks available for third party apps to fill in the gaps that Safari for iPad doesn’t address. Here are three alternative browsers that I use regularly to perform tasks I think are necessary for educational use and general use that I can’t do using Apple’s default browser. This fabulous app has become my default browser on my iPad. 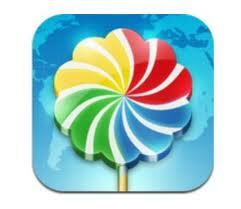 It’s as quick as Safari, as consistent in rendering and loading websites as Safari and has all the functions of Safari. But it adds so much more. 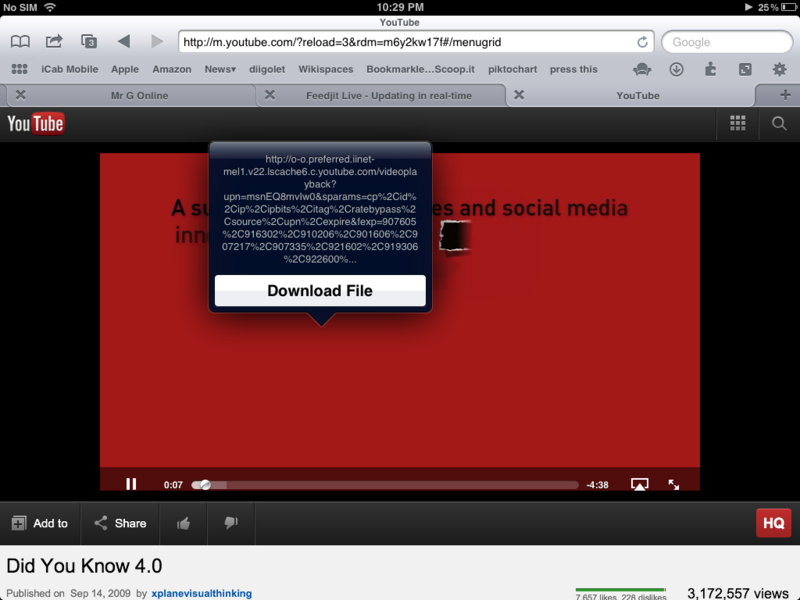 The big winner for me with iCab is its ability to download videos, including from Youtube. It means you can download videos to watch offline, add to iMovie for editing and reuse in presentations. This is particularly useful in a school setting. It is as simple as touching the video and a popup command appears as shown here. Once the video is downloaded, it can be added to the Photo Library on the iPad by going to the Downloads icon and saving to Library. From here is becomes accessible to any app that uses videos. UPDATE: Unfortunately, this feature has been removed on request from Apple. Apparently, it infringed on App guidelines. Another great feature of iCab is its multiple search engine access. It comes installed with the major search engines plus Wikipedia and IMDb. You can add your own search engines simply by going to your chosen site ( e.g. Creative Commons search) and adding it to the list in the Settings. When you go to the Search field, all of the available search engines are available for the user to choose, depending on the type of search needed. 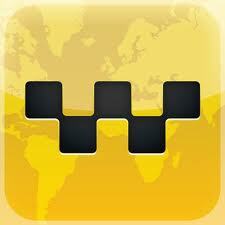 A third feature that is useful in iCab is its sharing and downloading options. By default, all you can do in Safari is Tweet on Twitter, email and print.iCab spoils you with choices. This is a great browser for annotating web sites during research. Through an unobtrusive floating toolbar on the side, you can access annotation tools that overlay the website currently open. Annotation tools include square, circle, arrows, straight and freehand lines, smudging and text tools. You can change the colours of each option. 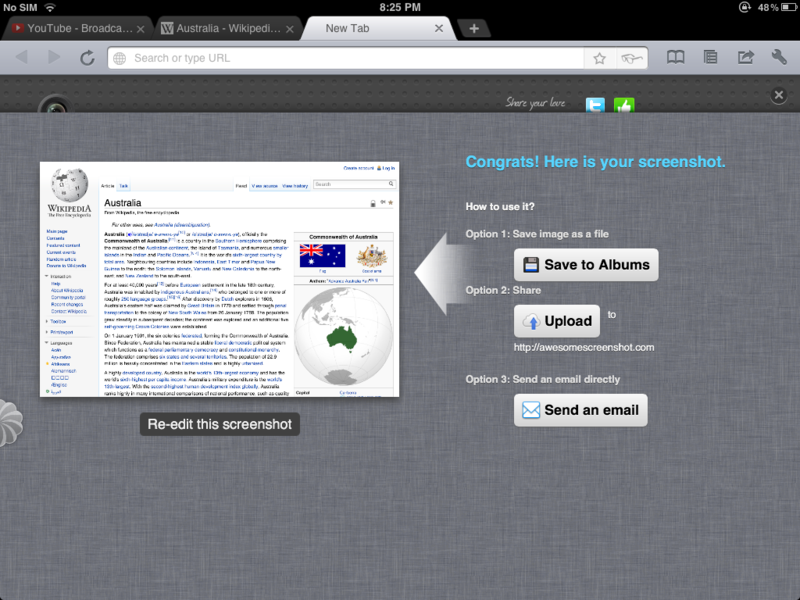 When you have finished, you can crop the page and take a screenshot of the page, saving it to the photo album, email or Twitter. 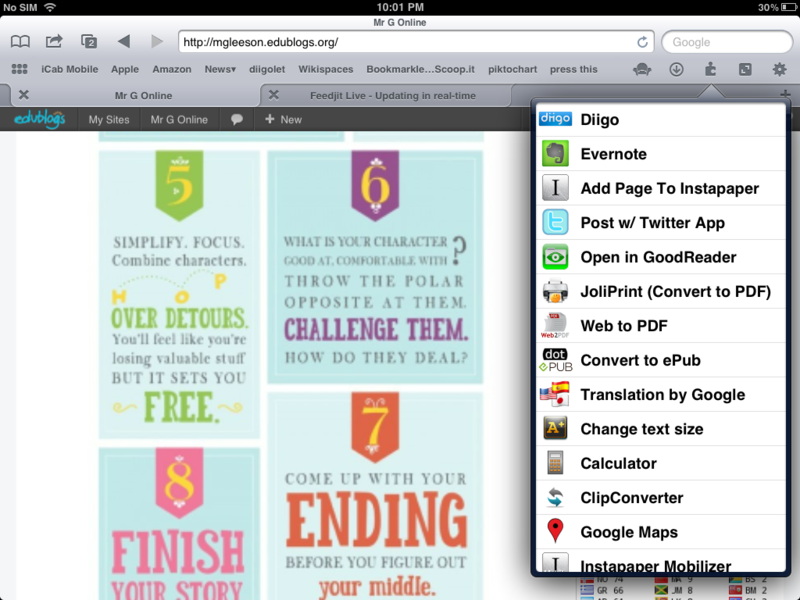 Similar to iCab, Diigo browser also has a lot of sharing options not found in Safari, including Diigo ( strangely not as effective as the iCab Diigo tool ), Evernote, Tumbler, GoogleReader, Instapaper and ReaditLater as well as Twitter and Facebook. 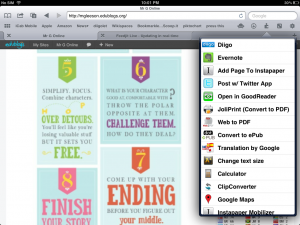 Combined with its annotation tools, this makes Diigo Browser an excellent research tool for students and teachers using an iPad ( there is also an iPhone/iPod Touch version.) Its free too. 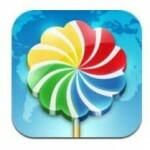 The Photon Browser, is the best of a range of iPad browsers for accessing Flash Websites. While it is well publicised that iOS devices don’t support Flash websites, Photon does a fairly good job by accessing servers that stream Flash functionality back to your iPad. Because of this streaming method, the whole experience is a little delayed and at times choppy. Nevertheless, it does work in may cases. Videos work well, Flash games are reasonable and even some Web 2.0 tools used in schools are useable. I have tested Prezi, Voki and Glogster with Photon. Voki works quite well ( albeit a little slowly as I mentioned).Glogs can be viewed with full functionality and editing Glogs is possible but not easily. Prezis can also be edited but with some difficulty. Viewing is more enjoyable using the dedicated free iPad Prezi Viewer app, which also allows for some basic editing ( but not creating). 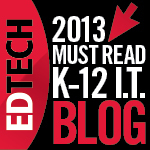 I’ve also been able to view Flash based Wix websites created by teachers who use Wix for gamification in education. To access Flash websites, click on the Lightning Bolt icon in the top right hand corner. This begins the streaming session using the flash compatible servers the app connects to. When in “Flash” mode, the app provides a keyboard that works with Flash functionality ( you can switch to an alternative game keyboard for Flash games ) as well as different mouse like functions via dedicated buttons. For just a small investment you can turn your iPad into a more effective browser with some alternatives to Safari. You would like to think with its apparent dedication to education, apple would add some of these features to future Safari versions. In the meantime, try these three browsers out. There are a lot of other Browsers on the App Store. You might have tried others that have unique features useful for school. Feel free to leave a comment to let us know about more alternatives. UPDATE: 26/7/2012 A couple of comments about how go get video from iCab to photo library. Hope this screenshot helps.